Yes, it has been an awfully long time since I last posted. I won’t try to excuse this, but merely by way of explanation let me just say that life has been happening. Shortly after the Pi Day post, I had to pack up my home office and move everything downstairs (along with almost everything else on the second floor of Freak Mountain) to make way for the removal of the wall-to-wall carpeting that we’d hated since the first time we saw the house, and its replacement with much nicer (and more environmentally friendly) bamboo flooring. We were in exile at a nearby Fairfield Inn for the better part of a week, which turned out to be more stressful than one might expect. After that, I painted my office, which had been an insipid peach-pink and dotted here and there with what I’m guessing were baby-food stains, and replaced almost all the old random furniture. Henceforth, I have spent a great deal of time reading in my new IKEA club chair. Of course, by now everyone knows about our legendary Winter 2015 Snowpocalypse, and that also took its toll. And then when springtime finally arrived, our friend V. finally succumbed to her advanced cancer at the Memorial Day weekend. So I’ve been feeling a little beat down is what I’m trying to say here. Since it was at V.’s July 4th party last year that I allowed myself to be talked into rebooting this blog, I decided that the holiday would be as good a time as any to pick up the thread I dropped last March. 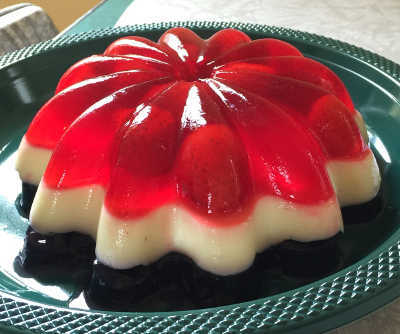 Patriotic Mold was on the schedule for this weekend, and it seemed like a nice, relatively simple one with which to start again – a basic layered Jell-O, with strawberry gelatin and frozen strawberries (I used Welch’s – not recommended), lemon Jell-O diluted to almost-white paleness with vanilla ice cream, and Berry Blue Jell-O with frozen blueberries. One good thing about doing this in 2015, as opposed to 1974, is that we have the Berry Blue flavor/color now. 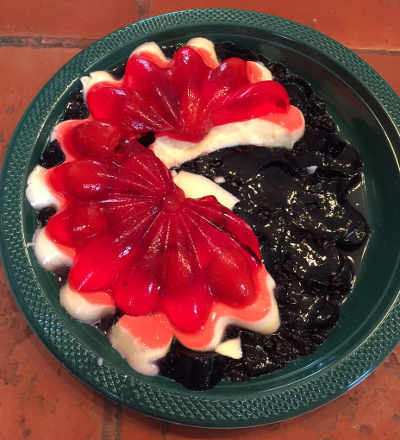 Since it didn’t exist back in the day, the recipe says to use lemon Jell-O and mashed blueberries to achieve the blue layer, though it seems to me what what you’d end up with would be a weird dark green. 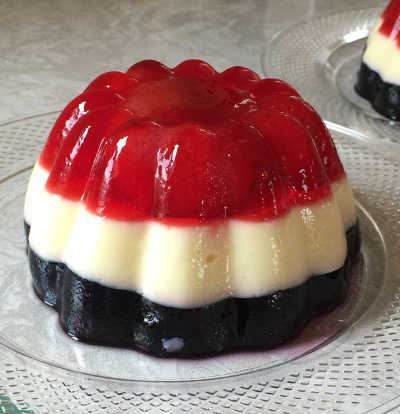 The book also suggests trying the black cherry or Concord grape flavors for the blue layer, but I think that would make it too dark. As it was, with the Berry Blue, my blue layer was a deep indigo, like the darkest possible wash of blue jeans. The sad state of my larger mold sadly reflected my feeling about the holiday. Although I love my country, I’ve never been what you would call a flag-waving patriot, and the recent race-motivated murders in South Carolina have left me feeling less sanguine about unity in these United States. I was sickened and saddened by the killing, and troubled by the subsequent rehashing of our old fight over the Confederate battle flag, what it stands for and whether it’s appropriate to continue displaying it. As a Yankee born and bred, I confess I don’t understand why some southerners stubbornly hang on to that flag, insisting that “southern heritage” has nothing to do with slavery or racism. At the recommendation of someone I know who was raised in South Carolina, I read Confederates in the Attic by Tony Horwitz. In it, Horwitz relates his experiences with Civil War re-enactors, and his visits to historic sites around the south and the people that he meets there. I was hoping that the book would shed a little light on the southern mindset; going on this journey with Horwitz, I wound up having a better understanding of how southerners arrive at a particular mindset, but I still don’t get why. Neither did Horwitz. What’s particularly worrying is the fact that the events described in the book took place twenty years ago, but they sound like they could have happened two weeks ago. I worry about what will happen if we can’t find a way beyond this impasse. P.S. On the positive side, I was greatly cheered by the Supreme Court’s decision on gay marriage. Since it was legalized here in 2004, Massachusetts has utterly failed to go to hell in a hand basket. I expect that will be true of the rest of the country, at least as far as marriage goes.